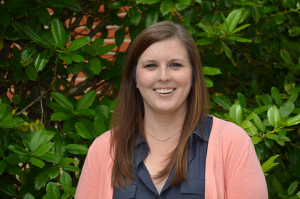 Counselor Education doctoral student Bethany Lanier was awarded a Leadership Fellow position with the International Counseling Academic and Professional Honor Society, Chi Sigma Iota, for the 2015-2016 academic year. She is one of only ten individuals chosen to serve this year. Chosen individuals provide evidence of their leadership potential within a CSI chapter. The 10 Leadership Fellows and Interns receive recognition, specialized leadership training, and financial support to attend CSI activities held in conjunction with the annual meeting of the American Counseling Association. Nominees must be members of CSI and have the support of their chapter including endorsement by the Chapter Faculty Advisor and a commitment for a matching fund award from the chapter. Auburn’s chapter advisor is Dr. Melanie Iarussi. Lanier earned her Master’s degree in Clinical Mental Health Counseling from Radford University. Her clinical background is in substance abuse counseling, career counseling, and behavioral issues. She is a National Certified Counselor and is currently in the licensure process in Alabama. Bethany’s research interests include substance abuse counseling with DBT, professional advocacy, and poverty outreach. Currently, she works as a grant evaluator with two grants related to underage drinking and after-school programming within poverty communities. She plans to become a faculty member post-graduation. During the 2015-2016 year, Lanier will serve on CSI’s Excellence in Counseling Research Grants Committee. In addition to helping CSI to choose research grant recipients, she will participate in the review panel that selects CSI-sponsored poster sessions for the American Counseling Association’s 2016 Conference and Expo. She will also be a reviewer for the Music section of the Counselors’ Bookshelf, which provides reviews of resources that professional counselors can use in their work with clients. Furthermore, she plans to work on projects that will engage other counselors in professional advocacy. Auburn’s Iota Delta Sigma Chapter was chartered in 1997. To date, the chapter has initiated more than 380 members and remains an active chapter of CSI. Congratulations Bethany! We are very proud of you.